Few men can claim to be one of America’s most feared duelists and war hero at the same time. Alexander Keith McClung proved to be the exception. A crack shot with a pistol, the “Black Knight” was reputed to have fought in anywhere from four to a dozen duels during his short lifetime. Despite his unsavory reputation as a cold-blooded killer, McClung would rise to prominence as a distinguished volunteer officer during the U.S.-Mexican War. Alex McClung was thought to have been born in either Virginia or Kentucky between 1811 and 1812. He joined the U.S. Navy at the age of seventeen years old as a midshipman after fleeing his home. His service did not last long, for he fought his first duel while in South America, wounding a man in the encounter. He left the U.S. Navy in disgrace after being ordered to resign and traveled back to Kentucky where he killed one of his cousins in another duel in 1828. Shunned by his family, he came to Jackson, Mississippi, in 1832 and served as an editor for a Whig newspaper and as a federal marshal for northern Mississippi. He killed two other individuals in deadly encounters leading through the 1830s and 1840s – supposedly killing a victim’s vengeful six brothers one at a time. At times he presented himself as a cultured and chivalrous southern gentleman, while at other times he was noted for his erratic behavior, fits of rage, and chronic depression. A Southern belle remembered him as a “man of reckless bravery,” proclaiming that “he was a man of fitful, uncertain moods and given to periods of the deepest melancholy. A natural leader of men, he raised a company for service in the First Mississippi Regiment to fight in the war with Mexico in 1846. One Mississippi newspaper claimed his reason behind enlisting to fight in Mexico: “Wearied of life, disappointed and satisfied, he wooed the embraces of death. With hope of being slain, he enlisted in the Mexican War.” Despite his death wish, he proved to be a competent and well-liked commander, able to identify the names of each man in his company. He was appointed to the rank lieutenant colonel of the regiment behind Colonel Jefferson Davis, the future president of the Confederate States of America. Colonel McClung led his men with his trademark fearlessness during the assault of Fort Teneria in September of 1846. 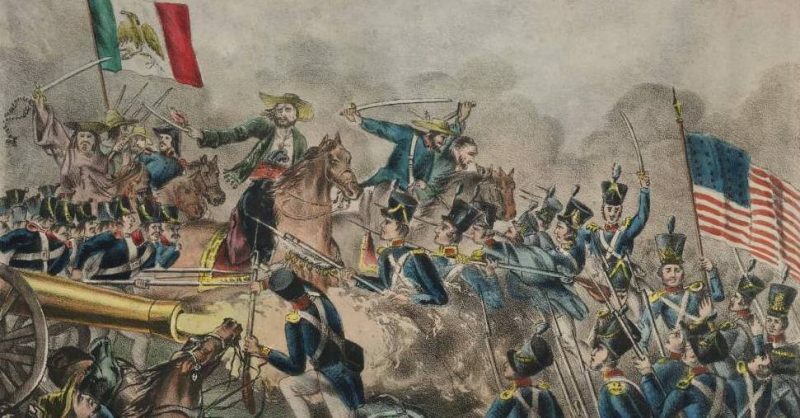 The Mexican fort inflicted devastating casualties upon the American soldiers in Gen.
Zachary Taylor’s American army assaulting the city of Monterrey, and McClung intended to capture it, even if it meant doing it singlehandedly. He received no orders from his superiors to seize the fort, but leapt in front of his old company and yelled to the men, “Charge! Charge! Tombigbee volunteers follow me!” and dashed forward. Other men from the regiment followed close behind, inspired by his bold maneuver. When Mexican soldiers slammed the door in the face of the pursuing McClung, “he rushed against the door like a tiger” and crashed in among them. McClung climbed to the top of the fort’s parapet, fully exposing himself by waving his sword above his head and screaming words of encouragement to the Mississippians. During the exchange of gunfire, a Mexican bullet tore into his hand that gripped his sabre, passed through his body and exited near his spine, shattering his pelvic bone. He crumbled to the ground and remained hardly conscience from the loss of blood. The Mississippians wrapped their fallen leader in a blanket and hid him in a deep ditch near the fort as the battle raged. That night, Colonel Davis called for volunteers to retrieve McClung’s body. While under fire from the adjacent Mexican forts and under heavy rainfall, they retrieved his lifeless body and transported him on a stretcher back to friendly lines. McClung miraculously recovered from these horrendous wounds despite the surgeon removing five fragments of bone from his body and amputating of two fingers. He received a ceremonial sword upon his return home for his service at Monterrey. The battle proved to be McClung’s finest hour, briefly overshadowing his past misdeeds for the first time in his life. The years after the war were not so prosperous for McClung. He received an appointment as an ambassador to Bolivia from Zachary Taylor in 1849, had to resign after fighting several more duels in Bolivia. In poverty, crippled, plagued by alcoholism, and isolated from his old friends, McClung sunk into a deep depression.